The heavy police response and the presence and use of military artillery during the protest in Ferguson, Missouri over the death of the unarmed teen, Michael Brown, is raising concerns. Calling for a sharp separation between the nation's armed forces and local police, President Barack Obama on Monday urged a re-examination of programs that have equipped civilian law enforcement departments with military gear from the Pentagon. Obama's remarks came as he called for understanding in the face of anger in Ferguson in the wake of a police shooting of an unarmed 18-year-old black man. Obama said the vast majority of protesters in the St. Louis suburb were peaceful, but said that a small minority was undermining justice for the shooting victim, Michael Brown. The initial police reaction to the protests drew attention to the militarization of local police departments, with critics arguing that the heavily-armed police presence only fueled the tensions. Attorney General Eric Holder and several lawmakers have suggested that the practice of supplying police with such military surplus be reconsidered. 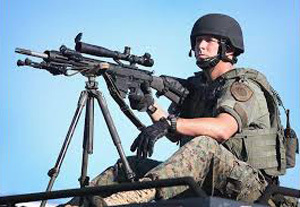 A report by the American Civil Liberties Union in June said police agencies had become "excessively militarized," with officers using training and equipment designed for the battlefield on city streets. Obama said he also spoke to Missouri Gov. Jay Nixon about Nixon's deployment of National Guard units to help secure Ferguson, urging the governor to ensure that the guard be used in a "limited and appropriate way." Pausing briefly in the middle of his summer vacation, Obama expressed sympathy for the "passions and anger" sparked by Brown's death. But he said giving in to that anger through looting and attacks on police only stirs tensions and leads to further chaos. He said overcoming the mistrust endemic between many communities and their local police would require Americans to "listen and not just shout." Obama said Holder would travel to Ferguson this week to meet with FBI and other officials carrying out an independent federal investigation into Brown's death. Separately, Rep. William Lacy Clay Jr., whose district includes Ferguson, told Democratic lawmakers Monday that he will meet with Defense Secretary Chuck Hagel to push for changes in the program that provides military equipment to local police departments. "There are young black men that commit crime. We can argue about why that happened - because the poverty they were born into or the school systems that failed them or what have you- but if they commit a crime, then they need to be prosecuted," Obama said. "Because every community has an interest in public safety." Follow Jim Kuhnhenn on Twitter.